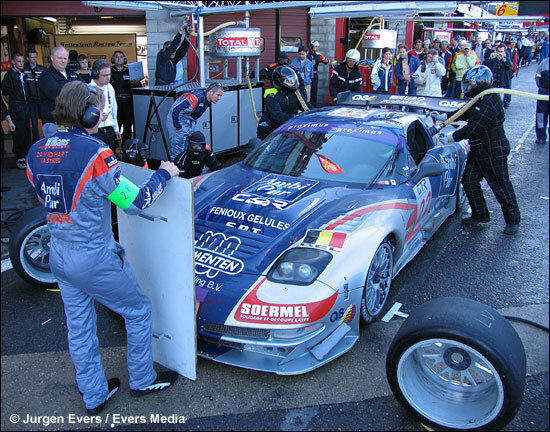 The 2005 Belcar Champions, with Marc Goossens / David Hart driving the blue Corvette C5-R, are tackling two series this year, Belcar again plus the FFSA GT Championship. Team owner Patrick Selleslagh is reasonably pleased with developments in 2006 so far. “We’re satisfied with the results so far, we had two podium finishes in Belcar and two in the French championship, both are very strong series, so this pleases me. Another important thing is that we’ve had no mechanical failures until now, which proves the reliability of the car and the good work of the team. “We’ve finished all the races but one: Soave and Cayrolle retired in Nogaro owing to a race incident. We’re waiting for a maiden 2006 victory, which will surely come. David Hart and Jeroen Bleekemolen are very keen to beat the GLPK car in Belgium and Christophe Bouchut and Yvan Lebon will surely win at least one race this year in France. Thierry Soave and Eric Cayrolle will be trying to score a first podium this weekend, at Val de Vienne.